The latest volume features articles on the newly-discovered tomb in the Valley of the Kings, Sinful Barbarians and Part- Time Legionaries. 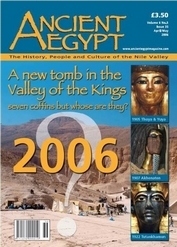 The latest volume features articles on the newly-discovered tomb in the Valley of the Kings, Sinful Barbarians and Part- Time Legionaries, Featured Pharaoh: The God’s Father Ay: Ay held senior positions in the court through the reigns of Amenhotep III, Akhenaten and Tutankhamun, before he himself became Pharaoh. Photo Feature: the Anubis Chapel in the Temple of Queen Hatshepsut, looks at the surviving decoration in this well-preserved Chapel in the much-visited temple at Deir el Bahri. Did the ancient Egyptians ever reach Malta? The ancient Egyptians had a lucrative trade with Eastern Mediterranean nations and islands. Anton Mifsud and Marta Farrugia look at evidence for their reaching as far as Malta. Ancient Egypt Magazine - Britain's only dedicated Egyptology magazine. The magazine features articles and book reviews on all aspects of Ancient Egyptian History, People and Culture of the Nile Vallery. The magazine is published 6 times per year. Robert Partridge is the Editor, he lectures for the University of Manchester, runs the Ancient Egypt Picture Library and is the author and publisher of several books on Ancient Egypt. He is Chairman of the Manchester Ancient Egypt Society. The Consultant Editor is Professor Rosalie David OBE, she is Director of the KNH Centre for Biomedical and Forensic Studies in Egyptology at the University of Manchester. She is also Director of the Certificate in Egyptology and the UK’s first woman professor in the subject, with many publications and TV appearances to her name.